Hooray! It’s Giveaway Day and we’re super excited to have Tracy Vasquez from Chicago-land’s Sugar Beez bakery. I met Tracy, her daughter and adorable granddaughter when she was stationed next to me at the Iron Cupcake: Beer event with her Goose Island Stout Cupcakes. To finish off spring week on a sweet note, one lucky reader will win a custom vacation-themed cookie basket from Sugar Beez. Judging by how fast Tracy’s cupcakes disappeared, I’m sure her cookies taste as good as they look! To enter, just leave a comment telling us about your “vacation sweet spot” (your favorite vacation destination)! 1. Give us your one minute bio – a little about you and then how you got into baking. I’m the mother to 5 daughters, grandmother to 2 babies, wife to Gil for 23 years. I opened Sugar Beez 3 years ago and started baking cookies about 10 years ago. I’d like to say I did it for my kids, but after they got sick of eating cookies every single day, it really became about me. I really just had a great time decorating cookies. I find it to be relaxing and enjoyable because I can tap into my creative nature and let it flow. When I couldn’t bribe my kids with cookies anymore I started giving them away. Then someone actually asked me if I would make some cookies for them and they would pay me for them…WHAT? I can make money with cookies? And so Sugar Beez was born. I love the challenge of creating custom cookies. Each order is created for the client’s event and it is rare that any two orders are the same. 2. What made you decide to start your own business? I decided to start Sugar Beez when I was asked a couple of times if I sold my cookies. I thought, heck, if people are willing to buy them, I’m willing to sell them! 3. What would be your advice to someone looking to start their own business? My advice is do your homework. Connect with SCORE, they have been an invaluable source of information. Attend any small business classes you can. The more you know the better your chances at being successful. But most importantly, don’t let anyone tell you that you can’t do it…don’t be afraid…just give it a try! 4. What is your favorite kind of cookie? My favorite kind of cookie is oatmeal, no raisins! Love them…the brown sugar butteriness of them….mmmm…now I gotta go make some! 5. Willing to divulge any of your cookie tips for our readers? 1) Roll out cookie dough between 2 sheets of parchment paper, you won’t have to use flour, which will dry out your dough. 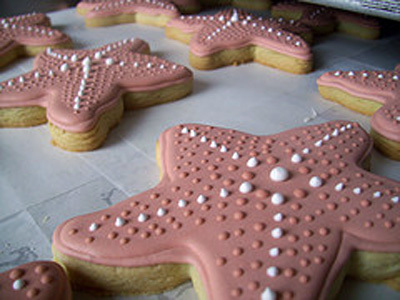 2) Mix your royal icing for at least 7 minutes on low and you will avoid clumps that would clog your decorating tips. 3) After your roll your dough between sheets of parchment, cut your shapes then move the sheet with your shapes onto a cookie sheet and freeze for 15 minutes before baking. This will give the dough a chance to rest and help prevent spreading when you bake. 6. What are 3 ingredients that you always keep on hand? Powdered sugar, meringue powder and flour. 7. If you could have dinner with 5 people, living or dead, who would they be? Billy Dec, Rick Bayless, Bronwen Weber, Will Smith and Oprah Winfrey! 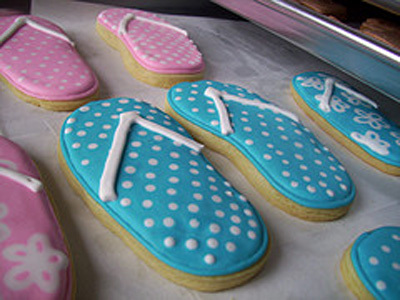 Check out more of Sugar Beez adorable cookies! That would be 1000 Islands in New York State. Any lake cabin in Minnesota. Such cute little towns and who doesn’t love boating around all day with mojitos? Yum! Those cookies look good! I have been going to Spring Training in Arizona ever since I was young. I look forward to it every year; the sun, the fans, the hot baseball players. I leave in 7 days! the cookies are fabulous!! thanks for the link and pictures. i’d say the dunes/beaches in michigan. it’s a quick trip, lots of hiking, biking and exploring for the kids, and a beautiful stretch of beach for me! we look forward to it every summer! The cookies are so fun! My best vacation was probably staying on a winery in Provence, but I have to say my favorite summer trips are always up to the lakes in MN or Maine! I love to go to Charleston for vacationing, because there’s amazing food and beautiful places to visit. I lived there for a few months before, and I think anyone who has been there for an extended amount of time would understand my love of the place! My favorite vacation spot is my family’s cabin in northern Minnesota. I love spending the week there with a few good books and my family! The cookies are so cute. My favorite vacation destination has to be San Francisco/Sonoma area. There’s always so much to do. cookies look delish! Right now I’m hoping to get to New Orleans soon. I haven’t been since I was a “tween” and have been craving a beignet!